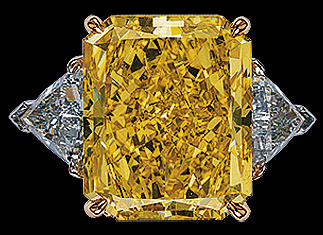 Yellow diamonds are found in tones from very, very light yellow to vivid yellow depending on the concentration of nitrogen when the crystal is formed. It is true that some diamonds can be treated to become yellow, but all the yellow diamonds sold by Joden World Resources are natural colors with gemological laboratory certification. Yellow diamonds are found in mines throughout the world.